Welcome to Mundy’s Ford House Bed and Breakfast, Cavan, where our guest’s comfort and satisfaction have been a priority for over 40 years. Our Bed and Breakfast Guest House is nestled in a quiet area in the drumlin hills just outside Cavan town, to the north west on the old Butlersbridge Road, right in the heart of the south end of the Annalee/Erne riverway systems. We are located close to Cavan Equestrian Centre, Lough Oughter and Lough Erne, Killykeen Forest Park and the Radisson Farnham Estate Hotel. We have had holidaymakers, professionals, people on working contracts, business people and fishermen (mostly from England, France and Germany) staying with us over the years. Our service and food are second to none. 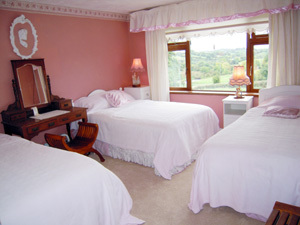 Our house is an old-style farmhouse with all comforts, including a guest room and a dining room. We have collected hundreds of favourable and affectionate reviews in our visitor log books over the years and have many return visitors. We can advise very well on the surrounding areas and can arrange taxis and transport to the nearby attractions, towns and villages. You can take a trip downstream in one of our boats or visit nearby Killykeen lake and forest park by boat. 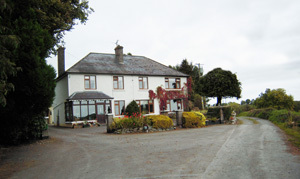 Many guests stay at Ford House Bed and Breakfast for a fishing holiday in Cavan. The best catch in one day was 210lbs (95 Kg) of fish, mainly Bream and Hybrids! We are surrounded by great fishing waters, the Annalee river is just a couple of minutes walk from the house. To read more about the possibilities for fishing in our locality please click here. Great food is assured in a friendly atmosphere. Our guests have come back year after year to us and we are proud of the service we offer. We have had thousands of people stay with us over 35+ years in business, and below are a selection of testimonials from people who have enjoyed our warm welcome and our hospitality. Ford House Bed and Breakfast has also featured in “La Pêche” a French fishing magazine, the review was written by Raphael Faraggi a professional fisherman who was a guest at our Bed and Breakfast. To enquire about room availability call us on +353-49-4331427 or please Click Here to email us.